In yesterday’s article, we covered the items you would need to produce a video job description on a budget. As Sean Gordon, Chief Executive Officer at HIRENAMI, pointed out, you don’t have to break the bank in order to produce an impactful video. All you need is a smartphone! Here, we’ll uncover how you can go about recording your video job descriptions. 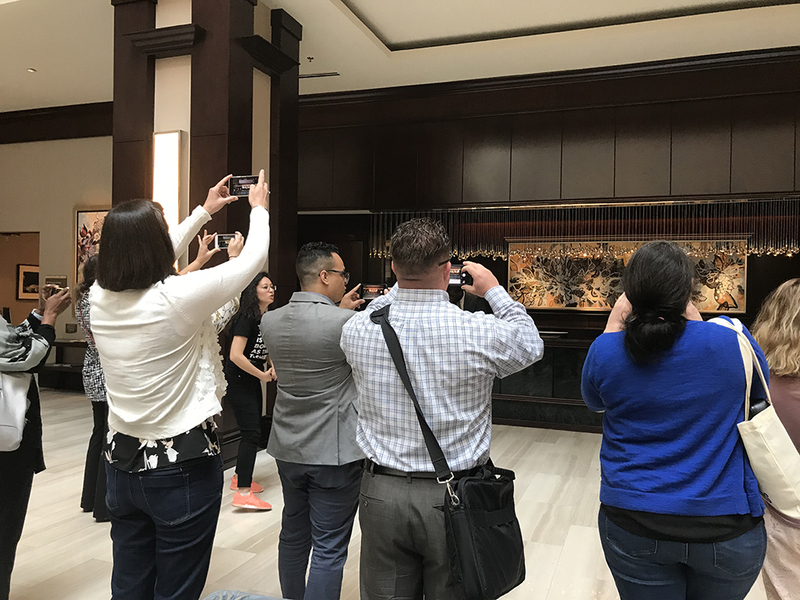 RecruitCon 2018 attendees capturing “B-roll” footage during Elena Valentine’s session. At RecruitCon 2018, in Nashville, Tennessee, Elena Valentine, SEO of Skill Scout, presented an entire session dedicated to creating job videos. In the session, Valentine explained the ins and outs of using a cell phone to capture video and then treated the audience to a firsthand example of how to go about getting started. Attendees were able to watch Valentine interview a Hilton Hotel employee, all while using her Apple iPhone. After the interview, Valentine unleashed attendees and had them go about recording “B-roll” video on their personal smartphones. B-roll is supplemental or alternative footage intercut with the main shot. You can watch highlights of this session, here, and you can view the final product, here. Be specific—pick one role to feature, and start the video with a realistic view of the day-to-day activities this role is responsible for. Also, if possible, pick one or two people in this role to interview so you have different perspectives to offer candidates. Keep it real—capture productivity, don’t stop it, and make sure to show stuff that makes employees quit. It’s better that candidates know the harsh reality before applying for the position. Keep it short—videos should not exceed the 2-minute mark, otherwise you’ll lose the viewer’s interest. Narrow down the two to three most important tasks the role requires and focus on that. You’ll want to show at least 30 seconds of each task for optimal effect. Show, don’t tell—minimize the amount of talking, and focus on the working environment. Also, make sure to take video from various angles and views, like close-up shots, wide-angle views, etc. On this final point, Valentine showed attendees a video her company did for a big-name airline. The company had a hard time recruiting employees because prospective candidates weren’t aware of the harsh working conditions they could be faced with. Skill Scout went to the airport on a rainy day and videoed the employees working in the rain to show prospective candidates what it’s like to work there, all the time, not just on sunny days! When using a smartphone, make sure to record the video in the horizontal Valentine couldn’t express this tip enough! Otherwise, if you shoot vertically, your video will have black bars on either side. Make sure to position interviewees in front of windows to offer better lighting so you don’t have to resort to expensive lighting equipment. Keep the videos short. This sentiment could not be expressed enough! Try to capture the interview/video in one take. You’ll get a more candid response to interview questions the first time around, rather than having the interviewee try to create the same “magic” in the second take. If you haven’t started using video to showcase your company culture/job descriptions, there’s no time like the present to start! As mentioned above, and in yesterday’s article, you really can create meaningful videos, affordably. If you have already started using video, how has it worked for your company? We’d love to know. Tell us in the comments section, below.